But perhaps the real reason the deer tweet went viral (besides sounding like a spare scrap of dialogue from a Paul Thomas Anderson film) is that it seemed to reflect a new heartlessness in the way that Grassley governs. Once a willing author of bipartisan legislation, Grassley has reacted to the Senate’s increasing polarization by becoming one of its most prominent obfuscators. Sensible, across-the-aisle solutions and the dignity of the office have been left to fester like so much roadkill during first Obama administration, and there doesn't appear to be a rescue mission on the way for the second one. Grassley, like many of his fellow senators, seems concerned not with the road ahead for the country, but with his own incumbency and his party’s electoral chances. Grassley joined Twitter in 2007, and though it might be convenient to connect his embrace of populism with his direct connection to the populace via Twitter (Grassley refuses to let his staff tweet for him, in case that wasn’t obvious), it more naturally jibed with the rise of the Tea Party. In 2009, after spending much of the year attempting to craft bipartisan health care legislation, Grassley realized that he was facing a more conservative primary challenger for his Senate seat. His support in Iowa decreased from 75 percent in January of that year to just 57 percent by September. He became less concerned with courting Democrats on health care, and more concerned with courting angry voters. Intemperate comments about death panels, involving the vivid phrase “pull the plug on grandma” came close behind, along with the aggressive, public Obama-baiting. Grassley won reelection in 2010, but he has clearly internalized the lessons of that cycle. And, perhaps, he has internalized something from all his Twitter use, too. Grassley has indulged his (rather impulsive) id on the social network, and become a star because of it. The more petulant he is, the more attention he gets. Like the weak-willed parents of a strong-willed toddler, the Twittersphere has reinforced Grassley’s bad habits, the ones he’s now flaunting in the Senate. Grassley was, for instance, the force behind one of the more embarrassing partisan sideshows in recent memory: after the USDA recommended “Meatless Mondays” in response to this summer’s drought, which wrought havoc on the nation’s agricultural supply, Grassley (and a backup can-can line of other congressional Republicans) responded by declaring that he’d try to eat more meat on Mondays to make up for it. Where’s the beef? Grassley’ll conjure some up, out of thin air, as long as it’s with liberals. In some ways, Grassley, who looks a bit like an aged and shriveled Arnold Schwarzenegger, is on more intellectually honest footing than others who have dipped a finger in tea and stuck it in the wind. Certain hallmarks of the Tea Party movement suit him: He is bullheaded by nature. He has been one of the loudest Republican voices against the banks in the wake of the 2008 financial crisis, and has voted with Democrats (and for Main Street) on the question of regulating derivatives. He proposed anti-hedge fund legislation in 2007 (and then again, with more traction two years later, amidst that rising tide of populism). Grassley has also always been distrustful of institutions and bureaucracy, and of the profligate advantage-taking within them. Witness his longtime, ongoing preoccupation with the internal affairs of the Smithsonian, for instance, or the SEC. He also played the role of stubborn-mule-blocking-Cabinet-confirmation long before procedural obstructionism became de rigeur in the Senate. And, like many of the new breed of righties, Grassley has always been a plain speaker proud of remaining outside Beltway clubbiness. “I don’t socialize in Washington !” he told The New Republic’s Eve Fairbanks in 2007, when she affectionately profiled him for this magazine. “I can tell you the last time I was in another senator’s home: John Cornyn’s, two years ago.” The difference, though, is that Fairbanks was asking about whether his bipartisanship made socializing with other Republicans difficult. These days, the question would more properly be asked about whether encountering his former Democratic allies, like Max Baucus, has become awkward. Perhaps the most stunning example of the way Grassley’s conservative principles have been put through a fun-house mirror in recent years was his investigation into six Christian ministries, begun in 2008. When it launched, it had all the hallmarks of a typical Grassleian endeavor: he was angry at the fancy lifestyles of and improper spending by the nonprofit institutions’ figureheads, enabled by their tax-exempt status. 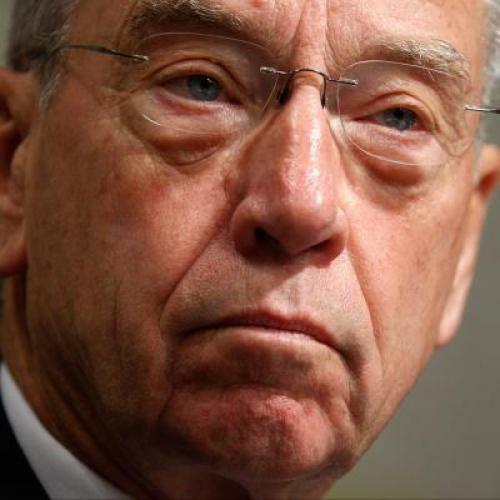 But when the commission wrapped up in 2011, not only did its report recommend self-policing by the missions, as opposed to any governmental wrist-rapping, but Grassley went a step further and took the opportunity to recommend that IRS rules be altered so that the nonprofit groups be allowed to endorse politicians. It could hardly be called a dog-whistle to the religious right; it was more like big old wet kiss. It is not as if, however, Grassley was a virgin-pure ideologue corrupted only late in life by Obama-era partisanship. In 2003, despite his fiscal conservatism, he unexpectedly provided key support for the Bush tax cuts. You know where those put us, and so does Grassley. With the fiscal cliff looming, he’s joined John Boehner in signaling that he’d be willing to consider tax increases in exchange for spending cuts. As for his own role in getting the budget so far to the brink, well, the key to surviving in the Senate involves just as little rear-view window gazing as driving down a state route in Iowa sometimes does. Will the compromise work out smoothly? Maybe. But given the track record of this Congress, which resembles the next one so closely, perhaps better to assume deal dead.